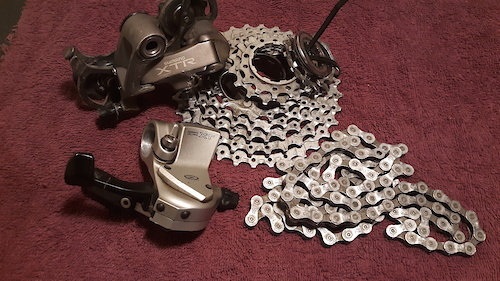 Older generation DH parts XTR 9 speed RD, M 952. 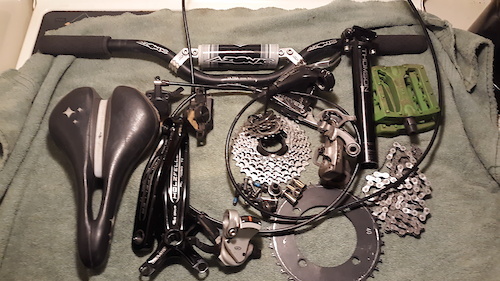 XT 9 speed shifter, M 750 Chain, Shimano HG. Cassette 9 spd, 11-32, HG M750 Chainring , Truativ AL 7075 T6, 40 tooth Crankset, Truativ ISIS Drive, AL 7050 TV, Holzfeller, 165mm Pedals, green Thermalite Seatpost, Thomson Elite, 30.9 x 215mm Seat, Specialized V-Groove Bars Azonic Ultra cross bar, 680mm Hayes Brakes, 7 MT. ( squishy, needs bleed) All items came off a vintage working bike. From 2003-2012 parts. 2002-2004 1st gen. Santa Cruz V10. With shock, headset, stem, seatpost collar, rear axle, BB, Spindle. Mavic Xe 729 Disc. 26" wheels, front wheel 110x20mm. Kenda Nevegal 26x2.5 tire in great shape, Rear wheel, Shimano freehub, 140x15mm, Maxxis High Roller ll. 26x2.4 new.